Come visit our state-of-the-art Technology Center in the Nord America. 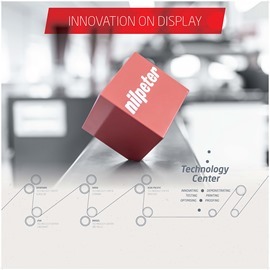 The facility serves as the perfect showcase for ground-breaking ideas and innovations from Nilpeter. You will experience printing demonstrations on standard jobs or your own specific jobs. It's up to you. Your choice of printing technologies is wide: flexo, digital, foil, gravure … and a number of different auxiliaries for different applications, such as de-/relamination, turnbar, stretch module, etc. A wide range of OEM-products. A large part of label printers face the challenge of finding the right combination of material, ink, printing plates, tape, anilox, etc.. In the Technology Centers, we see it as our task not only to help our customers become more productive through LEAN tools and methods, but also to help them achieve the highest possible printing quality at lowest possible cost and effort. That is why we continuously test all of the above-mentioned components in our effort to be your best …printing partner.